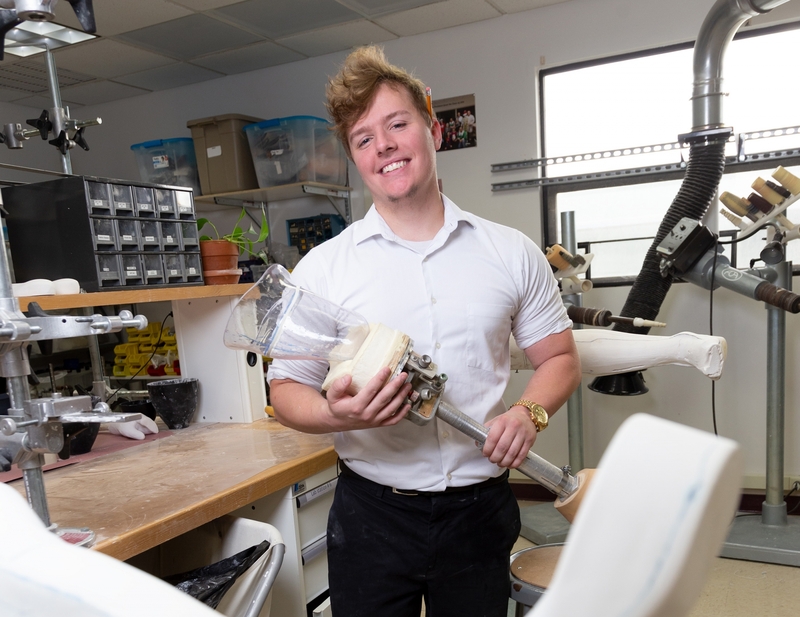 One Joliet Junior College student is determined to improve the quality of life for those that have lost extremities, just like him. Ben Reynolds is a bilateral amputee enrolled in JJC’s Orthotics and Prosthetics (OPT) program. Reynolds, born and raised in Bloomington, first became interested in the OPT field during his time at Shriners Hospitals for Children in St. Louis. As a patient himself, he was able to see how orthotics and prosthetics were fabricated and fit. “I found the field very thought provoking and admired the potential it has to influence and improve the quality of life for those with disabilities,” said Reynolds. After working in other industries, Reynolds decided that he wanted to try something new and help other people. During his junior year at a four-year university, he came across JJC’s OPT program. Reynolds never liked sitting in a lecture hall so the JJC program was a perfect fit. Now he receives hands-on learning in a lab setting. He’s also very involved in the JJC Orthotics and Prosthetics Association. He hopes to be hired by an orthotics and prosthetics practice where he’s able to interact with the patients while building their devices. Mike Brncick, OPT professor at JJC, said that Reynolds is a wonderful student to have in the program. Reynolds doesn’t want to be thought of as “disabled.” Even though he lost both feet to a birth defect called fibular hemimelia, a condition in which a part of or whole fibula bone is missing, he doesn’t want that to slow him down. Reynolds said that he’s had the obvious difficulties that come with being a bilateral amputee, but he was also able to play sports and have a normal childhood. As he grew older, reality started to sink in that he wasn’t able to walk. Now he’s able to push those thoughts away and strives for a future where anyone with a disability can live a normal life.